For the investment in both time and money, I have not seen anything that competes with Lincoln on their Motorsports Welding program. Where else are you going to get a crash course on properties and weldability of 4130 chromoly, stainless steel, aluminum, titanium, magnesium, and inconel? 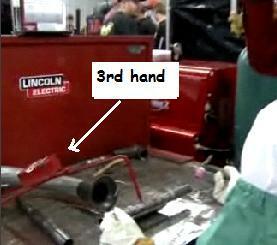 Lincoln kind of stands alone in offering a motorsports welder course. That is just plain smart. Have you heard about the Motorsports welding program Lincoln Electric offers at the Lincoln Headquarters in Cleveland, Ohio? tig welding and mig welding, basic metallurgy of carbon and low alloy steels and aluminum alloys, and welding rod / filler The Basic Motorsports Welding Program lasts 4 1/2 days and covers: metal selection for carbon and low alloy steels and aluminum alloys, oxyfuel cutting, plasma cutting, and brazing vs welding vs soldering. tig welding 4130 chromoly, tig welding titanium and procedures that accompany tig welding titanium like getting adequate purge, welding in a chamber, cleanliness of base metal and filler rod etc. The advanced program also covers tig welding inconel and magnesium and offers time for hands on skills supervised by Lincoln Motorsports instructors. There was also a mention of a 2 day advanced course but that one is not listed on the Lincoln website. Did you notice the red thing holding the 4130 tubing still while they welded it ? Its called a third hand. It is very easy to make from scrap materials and possibly the most handy welding tool ever. In fact , every welder needs at least 2 of them for holding small odd shaped parts still for tacking and welding. All you need is a heavy piece of round stock or flat bar for the weight, 2 pieces of 1/4" or 3/8" round stock for the legs, and one piece of 1/4" or 3/8" round stock that is sharpened to a point and bent at about 90 degrees.